Matt has agreed to stay behind with Freddie. We are driving back to camp, feeling like a pair of medieval horse messengers, carrying news from one village to the next. As we rush to reach home before the sun slips below the horizon, Tyler and I catch up on the events of the last two hours. Driving even faster than I did on the way out, we make it back to camp just before nightfall. As we pull in, everyone gathers around while we recount our tales once more. Sadly, the only thing any of us can do to help the situation is to have dinner waiting. We were planning on re-supplying today, so our food options are a little less than gourmet. The team chops potatoes, carrots and onions, dumping them into a pot with any noodles and grains people can unearth. All of our canned food goes in as well. Finally, Gem adds some fake meat that plumps up into tasty seitan. While the soup simmers, we wait. I am so thankful we're not out there driving in the dark of night with our LRC's woefully inadequate headlights. It has been over an hour – Freddie and Matt have yet to return; Gem is getting a little anxious about the whereabouts of her boyfriend. I know exactly how she feels. As the minutes tick by, guilt sets in. Matt was gracious enough to give me a ride to find Tara, and I've left him out there without so much as a thank you. I needn't wait long to apologize – I've just spotted the Swift's headlights in the distance! As they pull in, we all gather around once more to hear the latest news. Freddie and Matt exhaustively explain how they wound up waiting for over an hour in the dark for the truck to be prepared. In the process, the guy went around to every ger in the village to collect enough gasoline for the drive ahead. He even had to siphon several vehicles! Once that task was complete, he stopped for dinner at a random ger. Meanwhile, the guys wanted to get back to the group. When they tried to explain this, along with a host of other things, he completely ignored them. In the end, they left him to his dinner, and simply drove home to us. Now we are wondering if he will come to tonight, or tomorrow, or at all? Will he even be able to find us? Everyone is eating dinner when the question is answered. 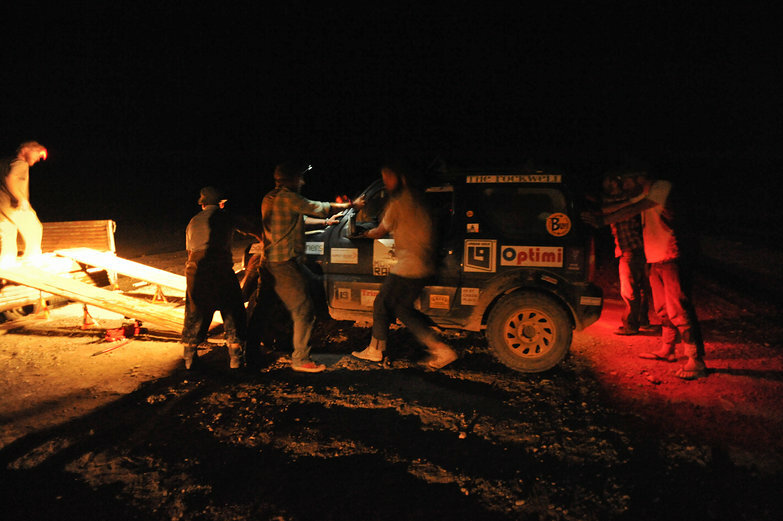 The huge truck lumbers up to our camp, its headlights cutting through the night air. Our driver wants to leave. Now. It is nearly 10PM! Not wanting to miss our chance, we all drop our dinner to mobilize the rescue operation. The road surface is a few feet above ground level, dropping down sharply towards the desert floor. Our Mongolian driver has pulled his giant truck off of the road, backing it up to the ridge. It is still a few feet too high, and there is no way we can lift the Jimny (even with 8 people, we've tried). First, Richie and Freddie lay down a pair of 2x10s they've been carrying. Next, the sides are removed from the truck and placed on top of them. It is a fiddly support system, but it is the best we can do out here. Roughly measuring the distance between the wheels, we soon have a ramp. Now, all we need is a driver. Some quick calculation deems that Gem and I are the lightest members of the team. I end up behind the wheel. Inside the Jimny, I turn the ignition to unlock the steering column, roll down the windows, put the car in neutral and lean out the driver's side window to keep an eye on the only side of the ramp I can see. Once everyone is clear about the plan (push really hard), we give it a go. We only have one shot; if the 2x10s break, or the ratchet straps Tom has devised to hold the axle together snap, we're in for an even bigger disaster. 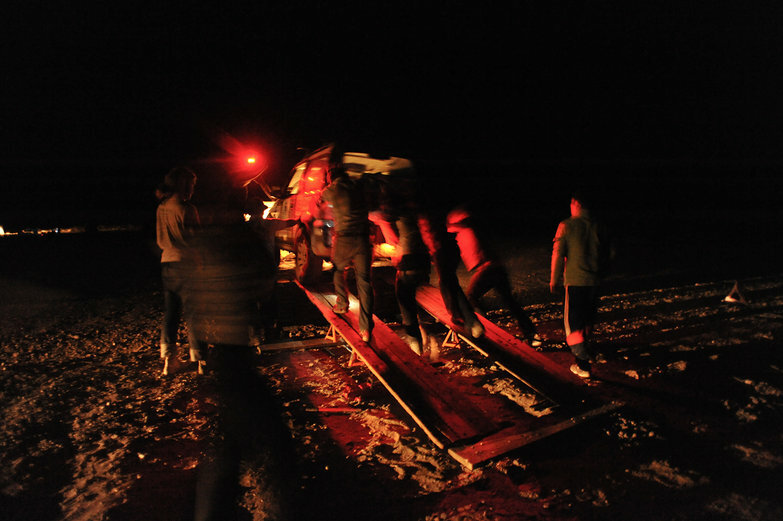 In one coordinated and back-straining effort, the team manages to heave the Jimny up the ramp. The ailing Suzuki barely fits. I jab the brakes just before the bumper smashes into the back of the truck's cab, and we're there! Immediately after, the giant truck blows a tire. Mongolia just won't quit. Charlie grabs his foot pump and goes to work. 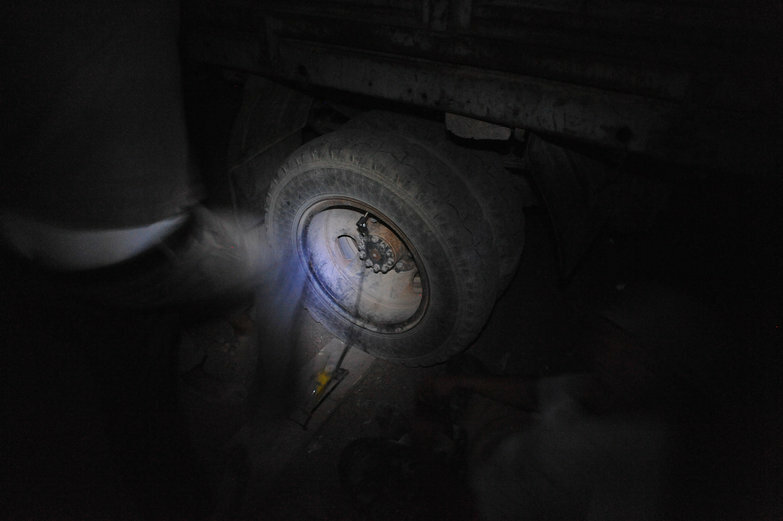 The tire seems to have a huge gash in it, but our driver almost yells at him to pump it up anyway. Once the tire is acceptably flat, our Mongolian driver pulls up to the road, ready to leave immediately. And so, Charlie and Tim, in a show of solidarity, depart with Freddie and Richie. 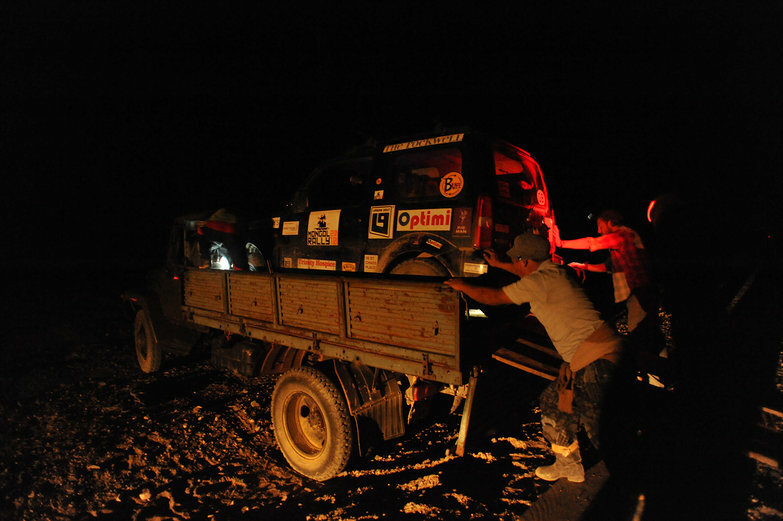 The four of them plus the driver (and much of his family, who are in the cab with him) will make the 80km trek through the darkness to Altai. With one headlight. How comforting it is to be finished at last with yet another unyielding day in Mongolia. I am tired, and I feel ill. As I curl up in our sleeping bag, the wind outside picks up. Sand begins to blow into our tent, dusting everything in a fine layer of grit. As our clothes, our electronics, and everything we own becomes slowly inundated with pieces of rock so small that no amount of blowing or shaking or wiping can clean them, Tyler breathes in and out deeply, with intense purpose. This is probably his worst nightmare. We run our camera and our computers back to the car, where we stow them safely behind panes of glass. Before falling alseep, we decide once and for all: we're not really desert people. Crossing the country in little hatchbacks isn't for the faint of heart, though. We've heard the roads will be paved in a few years. Kind of sad, really.